Thanks to Almond, every nook and cranny has Wi-Fi. Not that you needed Wi-Fi in your cranny. Almond devices come with an easy access touchscreen that lets you set up Wi-Fi in minutes so you can use your wireless devices in every room of the house. Almond is as easy to secure as it is to set up. Almond doesn’t let uninvited guests on to your Wi-Fi network. Download the free Almond app to easily monitor and control your network right from your smartphone and tablet by receiving push notifications whenever a new device joins your network. 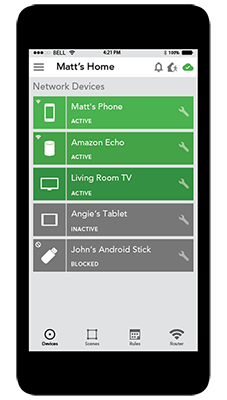 To remove any device you don’t recognize or want on your network, instantly block them with the press of a button. Know when your kids are home with Wi-Fi Triggers. The free Almond app includes several cool features like Wi-Fi Triggers. With push notifications to your smartphone and tablet, you instantly know who is entering and exiting your home. Curious when your house cleaner, kids, or in-laws arrived or left the house? With Almond, there’s one less question unanswered. Another free feature included with the free Almond app is Parental Controls. 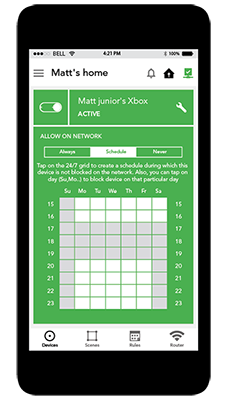 Now limiting your kids’ screen time is as easy as pressing a button. Program the same time limits every day or manually control it. For example, you could block Wi-Fi on school nights after 7 PM or decide as you go when to restrict their access to Wi-Fi.